Cosina of Japan was first of all a producer for other brands. 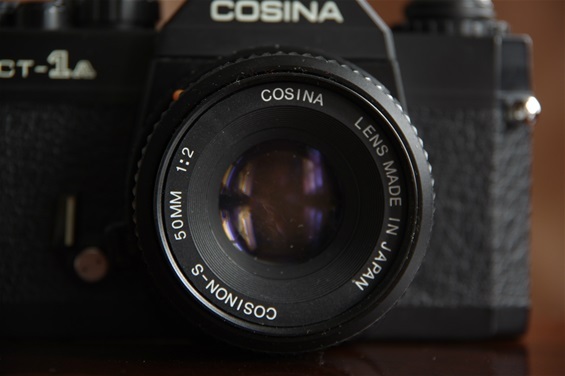 There is a list, the Cosina List, containing more than 113 models they produced, with only a little share bearing the Cosina label. Cosina was a mass producer of cameras, mostly for other brands. They never came up with any big news themselves, but produced well functioning cameras. I came across a list of 113 models confirmed to be produced by Cosina, according to the author, and three more not yet confirmed. Only 25 of these models wore the Cosina label. Here is a CT-1A a good working plain camera. All Cosinas, also most of the house brands they produced, had Pentax K-mount, the closest one came to a universal mount. Size: 133x85x51. Weight: 418 grams. Sn. 90602046. A Cosninon 50/2 lens followed most Cosinas. Note that Cosina did a smart choice by featuring the Pentax K-mount on all Cosina labelled cameras and on most house brands they produced, thus avoiding being isolated with a mount that few would want. The K-mount opened a door to all Pentax lenses (and most others by adapters). Hi-Lite EC, Hi-Lite 405, CSM. The actual number is actually higher than 113. For example, the Yashica mentioned is really not one camera, but at least four: FX-3 of 1979, FX-3 Super and the FX-3 Super 2000. And in addition: The FX-7, that was a FX-3 with a silver body. 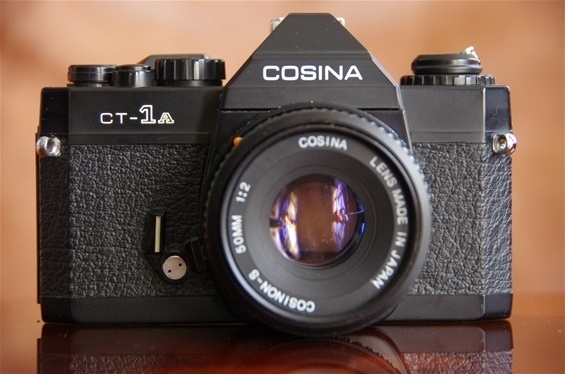 Cosina itself produced C-1S and C-3 in addition to the ones on the list. The German trading company Photo Porst produced their Porst and Carena cameras mostly at Cosinas. Of the 26 Porst SLRs and 20 Carenas, probably a lot more than the few listed above were produced by Cosina. For instance, the Porst M-CE is identical to the Chinon CE-II. And among the many Chinon cameras produced by Cosina was the CE-II. But the Porst M-CE is not on the list. And Miranda MS-3 is also missing. There are other similar examples. So, probably most of the many house brands sold by warehouses all over the world were produced by Cosina. And they bought (or just used) some famous brand names after they had to give up producing PP SLRs, like Miranda, Topcon, Petri, Exakta and Voigtländer. Miranda MS-series of the 80s, for instance, had nothing to do with Miranda, as they ended in 1976. Even more interesting are the names Canon, Konica, Nikon, Olympus and Pentax on the list. They are not represented by their top models, but Cosina evidently was so cost effective that they were able to produce some less advanced top sellers for the big ones, and more economically than they could do themselves. The Canon, Nikons, Konica and Olympuses are confirmed through other sources, such as Camerapedia. The Pentax P30T is not confirmed elsewhere. But after having outsourced assembly, then production of the K1000 for some 20 years, it would not be unlikely if Pentax did it again. Cosina made PP SLRs into the new millennium. 2004 may be the year they ended production. Today, giants like Asia Optical in Taiwan (and elsewhere) is doing the job. And most likely making more models with famous labels than we would like to know. Sorry, vivitar has the same shape but different texture of the handle and a smooth surface of the body. Adding: the first 4 seem like the same model. The Petri is almost identical, but has a different shaped grip. The Vivitar V365 is hard to find. Many of the model names on the Cosina list were identical cameras. Whether that goes for your 6 models, I do not know. But it wouldn't be unlikely. The official producer was Chinon, according to Alpa sources. But we know that Cosina produced some cameras (and lenses) for Chinon. The ALPA 2000 was a Cosina with M42 mount. I used to own one. Ever wonder why there are ALPA badged M42 lenses on eBay? They are from Cosina too. Sadly not found the Ricoh XR-7 / Sigma SA-1 / Sears KS-2 camera(s) on the site. They could be produced by Cosina as well, but I have no information about this.